In 1993, King Baudouin of the Belgians died unexpectedly during his holiday in Spain. I remember it vividly: I was 12 years old at that time and it made a huge impression on me. 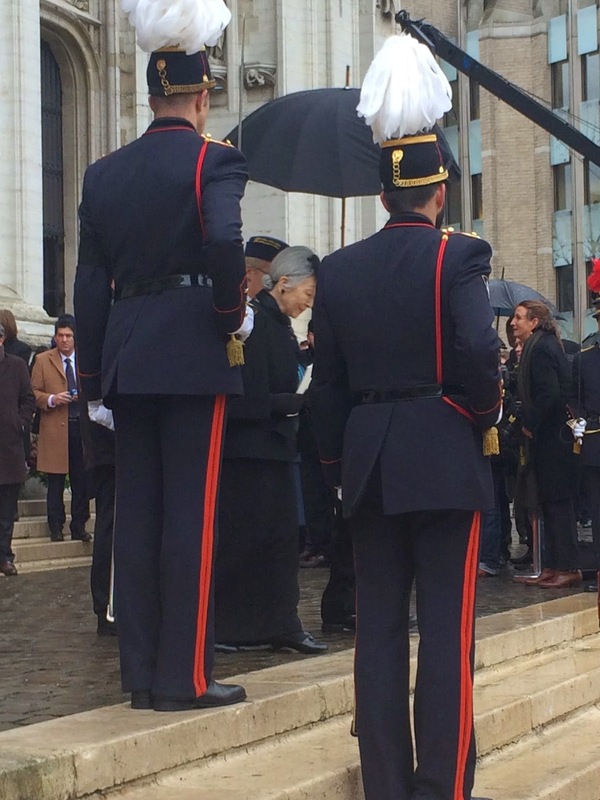 There was a huge outpouring of emotions from the Belgian people and his funeral was an impressive event, attended by many heads of state from all over the world, including Queen Elizabeth II, the Duke of Edinburgh and the Emperor and Empress of Japan. 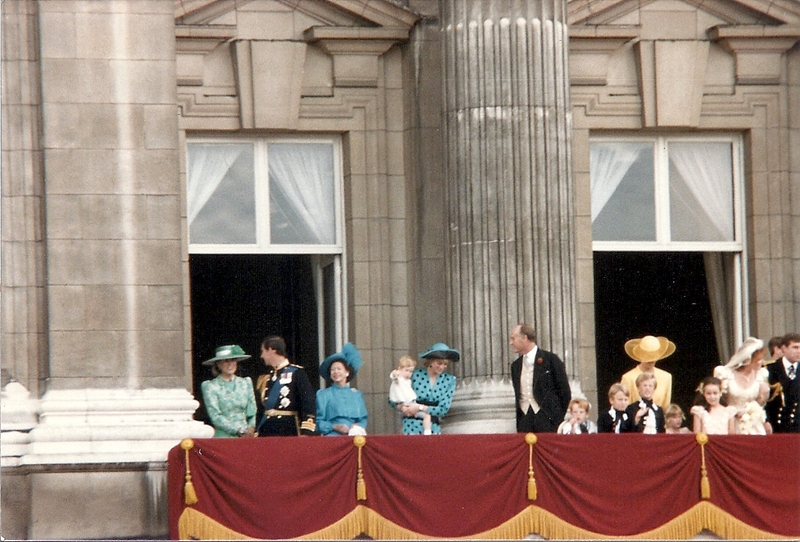 For me, it marked the beginning of a fascination for royalty that lasts until this day. 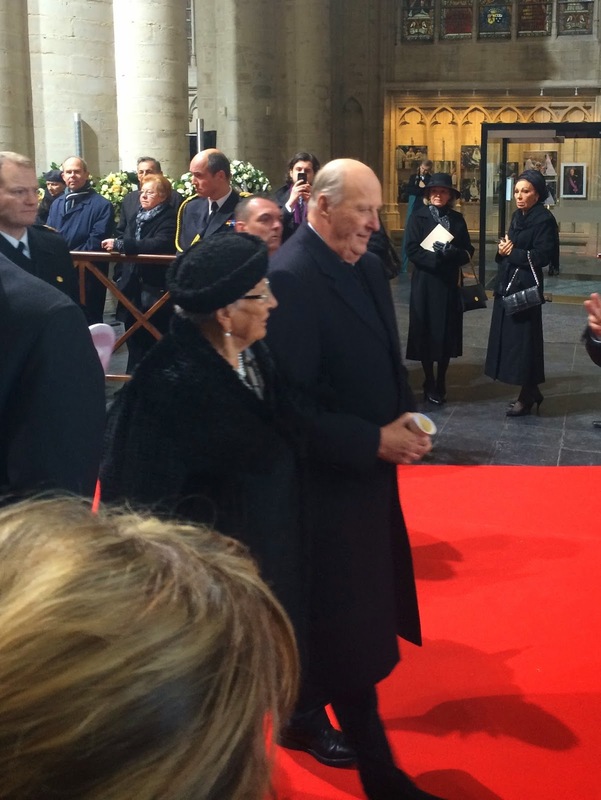 More than 21 years later, King Baudouin's widow, Queen Fabiola died on December 5, 2014, at the age of 86. 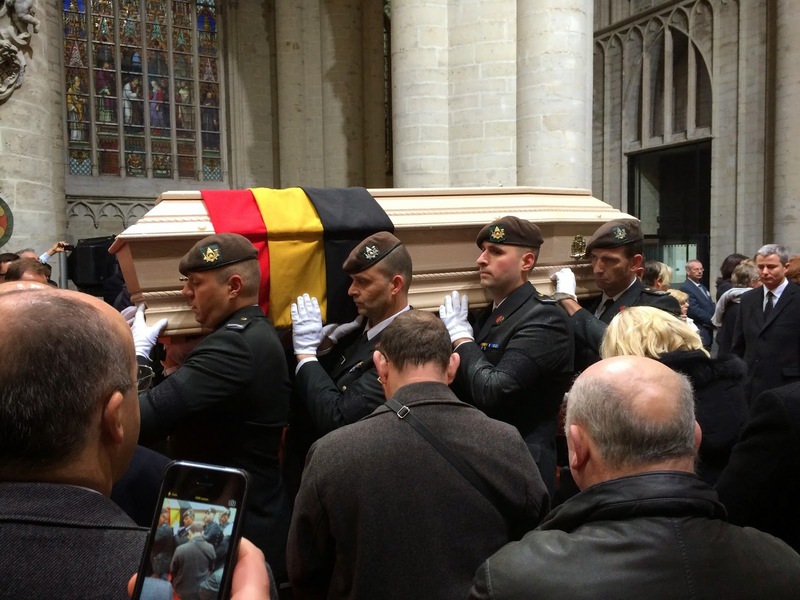 The funeral would take place a week later, on December 12, in the Cathedral of St. Michael and St. Gudula in Brussels. A few days after the Queen's death, I read that 200 seats in the Cathedral would be available for members of the general public. Those interested could send an email with some personal information. I live in the Netherlands (not even a two hour ride by car from Brussels) and I would be free on the day of the funeral: I decided to apply for an invitation. I didn't expect too much of it: I figured many people (5000, as I heard later) would try to attend and most inportant: I'm Dutch and I expected that only Belgians would be allowed to attend. I almost forgot about it, when on Thursday December 11 (a day before the funeral) I received an email with a pdf-file containing an invitation for the funeral! I was flabbergasted. I had never expected this! That afternoon, I was busy sorting out my outfit and making travel arrangements. 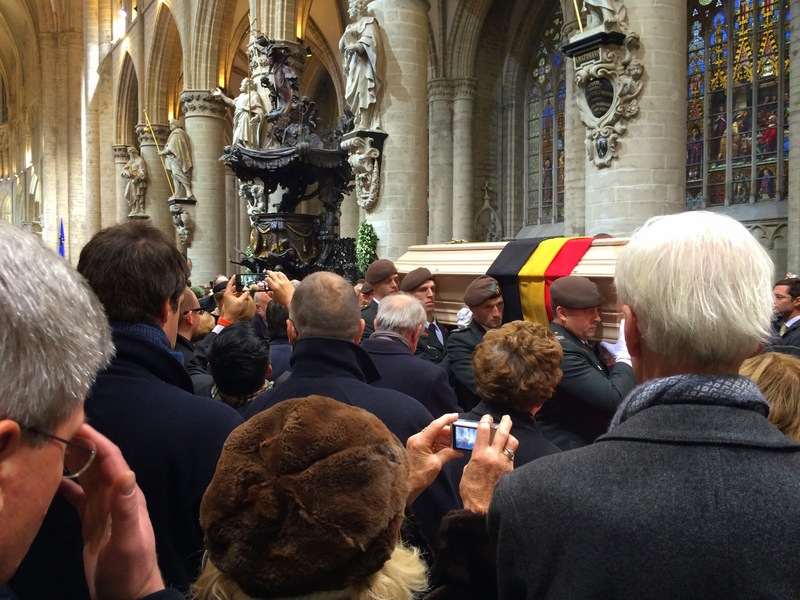 The day of the funeral, I got in my car at 6 a.m., to drive to Brussels. It was very bad weather. There was a storm. and after two hours, I arrived on the outskirts of Brussels. I parked my car, took the subway and half an hour later, I was at the Cathedral. A police officer looked at my invitation and my ID and everything was okay. I was amazed that security measures didn't seem tight: I wasn't extensively searched or whatsoever. Before I knew it, I walked on the main stairs of the Cathedral. I almost felt royal myself! Inside the Cathedral, I could take a seat in one of the last rows of the Cathedral. I had a good seat: fourth seat from the aisle, about the seventh row from the back. Not bad. It would take another hour before the service would begin, but I knew that it would be a great hour, watching many high guests arrive. During that hour, I could see many guests arrive. I saw Archduchess Yolande of Austria arrive with her son Rudolf. I also saw Grand Duke George Mikhailovich of Russia walking by very quickly, with huge steps. He seemed to be in a hurry. 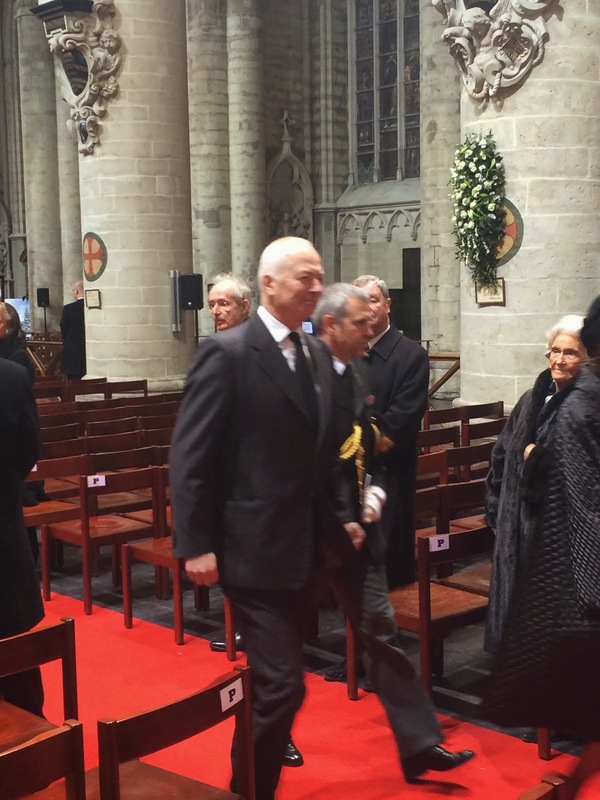 I also recognized the Duke of Braganca, Princess Isabelle of Liechtenstein and the Duke and Duchess of Castro walking by. Meanwhile, I saw on the TV screens that King Juan Carlos and Queen Sofía of Spain and Empress Farah of Iran were already inside. I was surprised: I would have expected Juan Carlos and Sofía to arrive later, more in line with the order of precedence. Later it would appear that this was only one of the strange things concerning protocol and precedence that day. 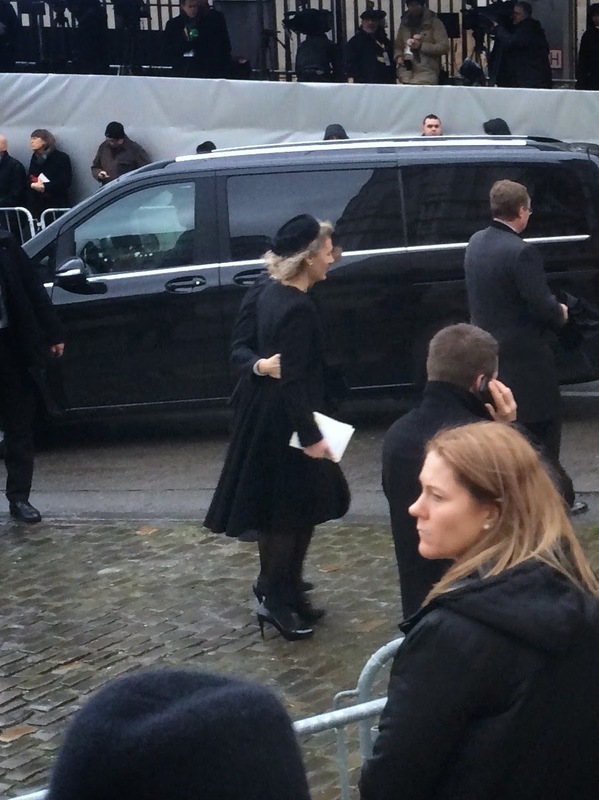 Many descendants of the late Queen's sister-in-law, the late Grand Duchess Joséphine-Charlotte of Luxembourg, attended the funeral. Besides all of her children and their spouses, I also saw the children of Princess Margaretha and Prince Guillaume. Later, it appeared that also some children of Prince Jean attended, but I failed to recognize them. Of course, also Hereditary Grand Duke Guillaume and Hereditary Grand Duchess Stéphanie attended. After that, the highest ranking foreign royal guests arrived. Prince Moulay Rachid of Morocco, Princess Beatrix of the Netherlands, the King of Norway with his sister Princess Astrid, the King and Queen of Sweden, the Empress of Japan and the Queen of Denmark. 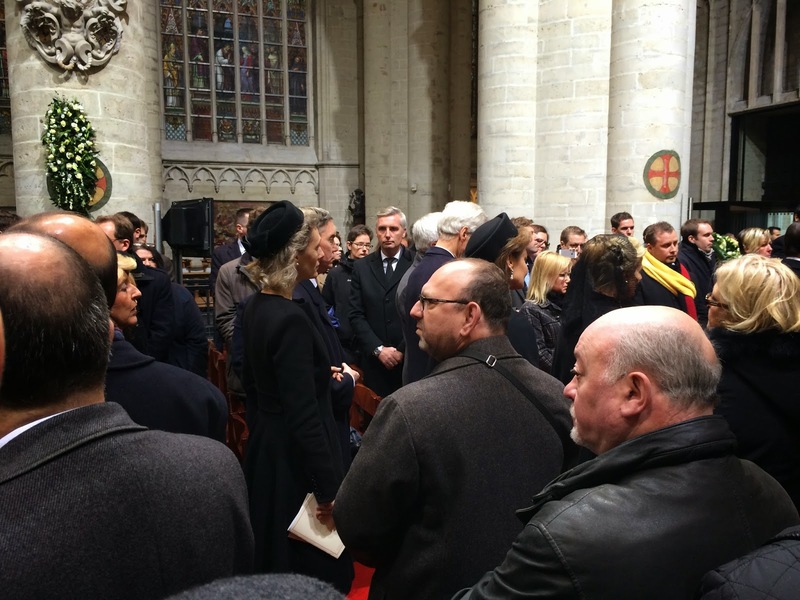 It was nice to see that the congregation stood up when a high guest arrived: a huge difference with the Netherlands, where everybody remains seated (f.e. 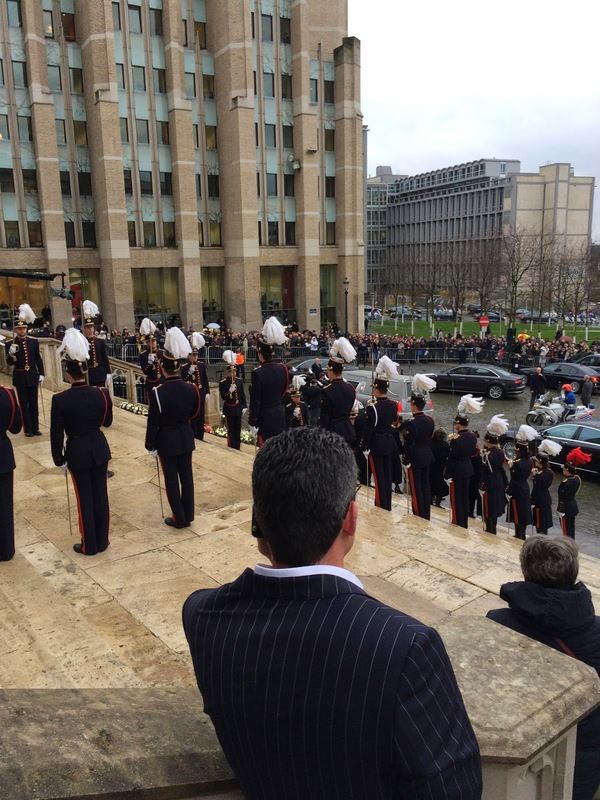 the Inauguration of King Willem-Alexander). Very respectful. I even saw some curtseys here and there. When the Empress of Japan arrived, everyone seemed very impressed by her quiet, regal presence. As you can see, I took some pictures. I was in doubt whether it was the appropriate thing to do. Many people made pictures with their cell phones and in the end, I decided to take some pictures myself as well. Maybe I shouldn't have done so, but as this was such a unique experience for me, I couldn't resist myself. 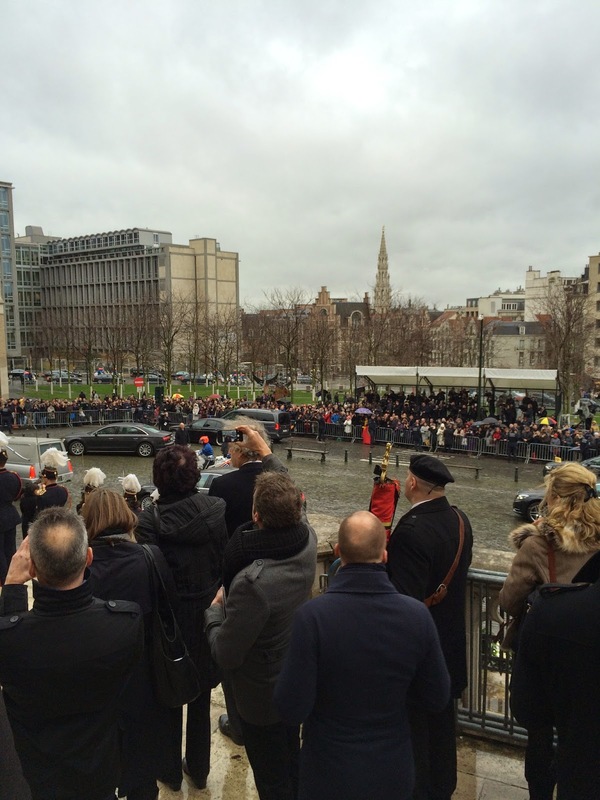 Then, the casket containing the remains of late Queen arrived, followed by the members of the Royal Family. Very impressive. Then the service began. I'm not religious, but I think some beautiful texts were being read and the soprano sang beautifully. I was most impressed by the Spanish choir, that was joined by the Marchioness of Ahumada, one of Queen Fabiola's nieces. 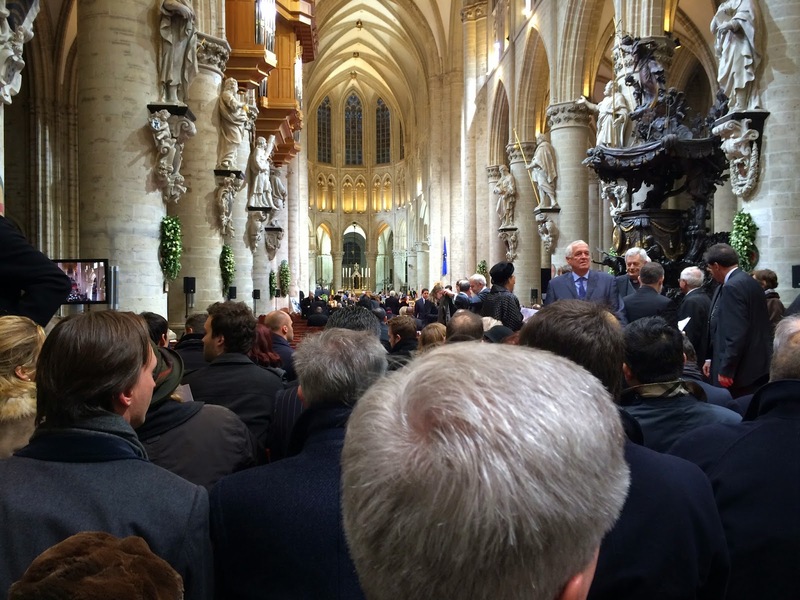 The acoustics on the Cathedral made it even more memorable. Beautiful. Turned out I seemed to be the only non-Catholic of the 'normal citizens' attending (not that surprising of course), because when everybody could take Communion, I was the only one who didn't take it. 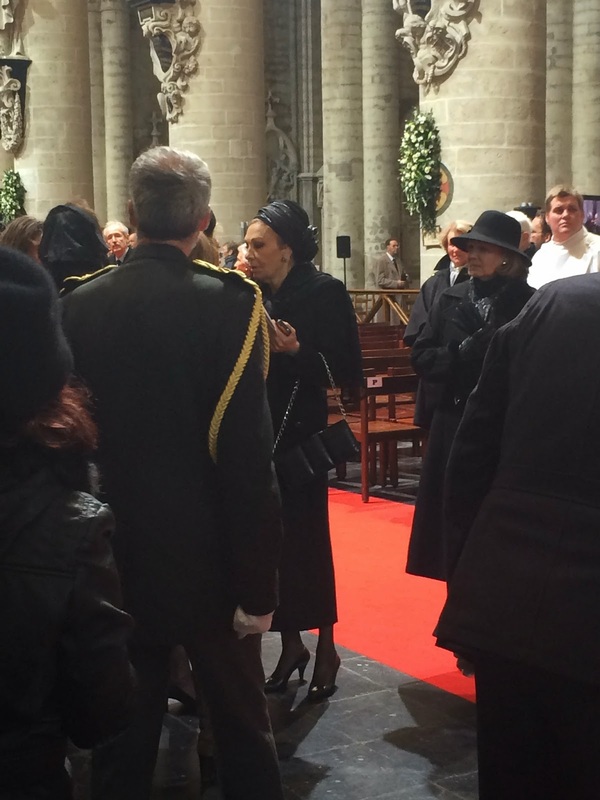 After a 2-hour service, the coffin, the Royal Family and the extended family of Queen Fabiola left the Cathedral. 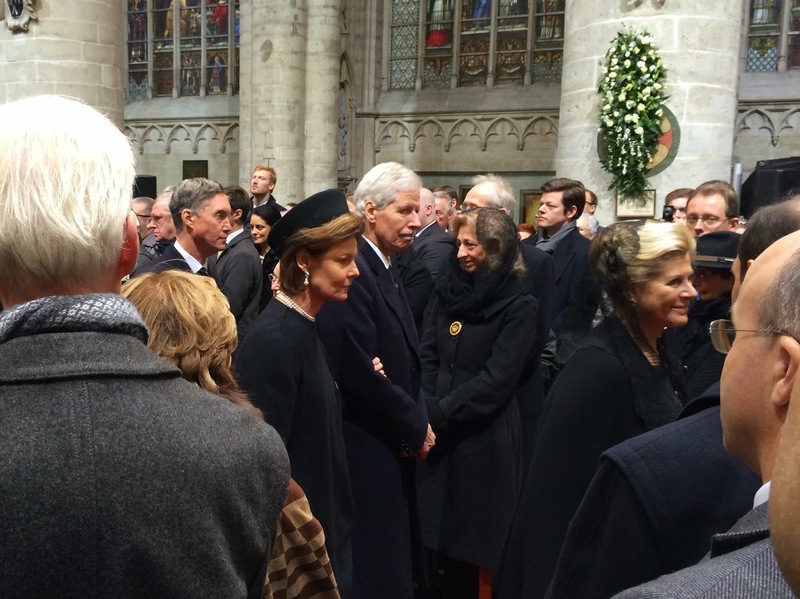 King Philippe, Queen Mathilde and King Albert II. Left to right: Prince Guillaume of Luxembourg, Princess Margaretha and Prince Nikolaus of Liechtenstein and Princess Alexander of Belgium. 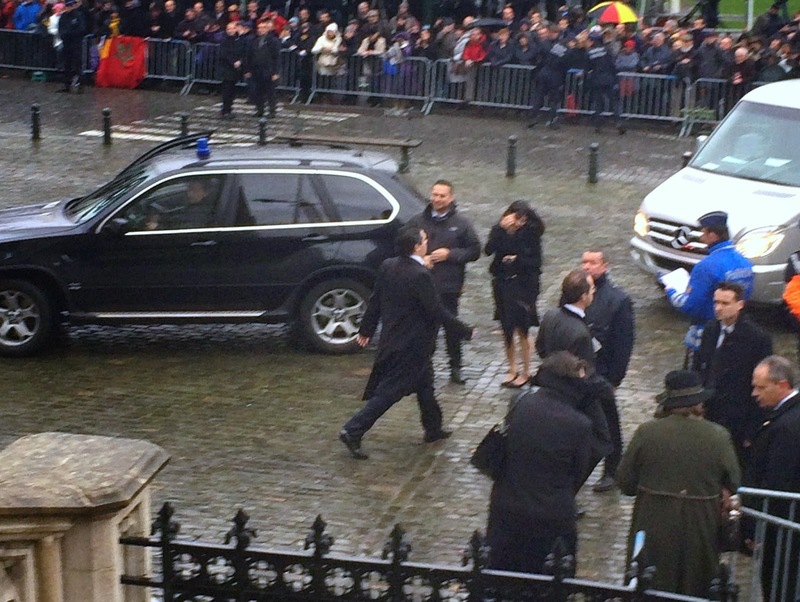 Next to Prince Guillaume: his wife, Princess Sibilla. After the family had left, I expected that the next to leave would be the highest ranking royal guests, as protocol prescribes. I didn´t expect to be able to leave the Cathedral for the next 30 minutes or so. Not that I cared: it would be nice to see all the royals walking by. But to my surprise, an official made clear that we were all allowed to go. Everybody stood up and I walked to the door. I was very surprised. I walked outside and everybody could stand on the steps, while the car with the coffin and the cars of the family still hadn't left. The logistics were all a bit chaotic. 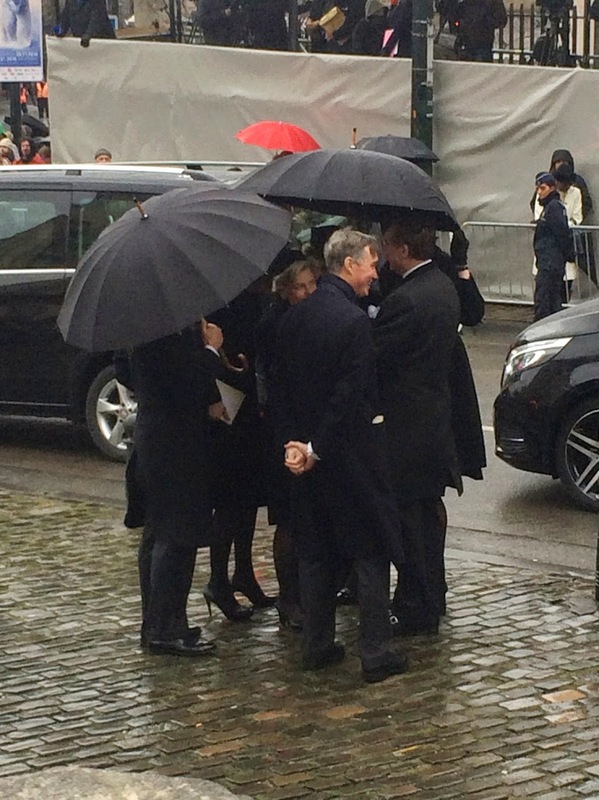 I walked off the stairs and I was that the Luxembourgish siblings (Marie-Astrid, Margaretha, Jean and Guillaume) and their spouses all had to wait in the pouring rain for their cars to arrive. 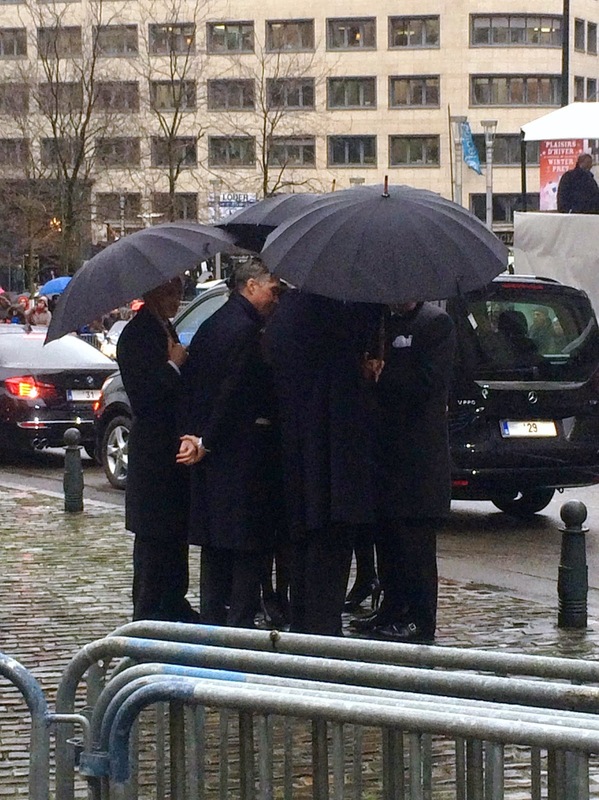 They all hid under an umbrella. I could hear them laugh about it and I could make some nice pictures of them. 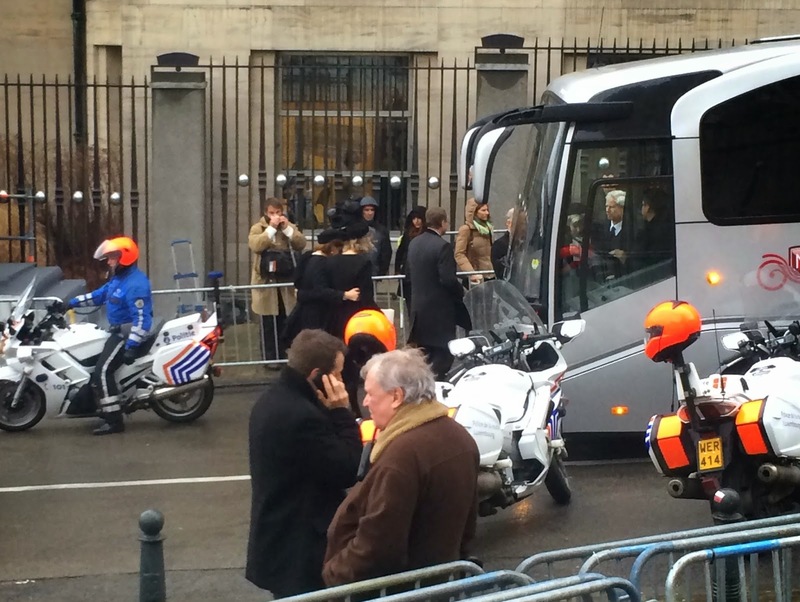 When their bus arrived, I could see Princesses Margaretha and Sibilla walking to the bus while holding each other. They seem close. I walked back to the Cathedral and was on the stairs again. 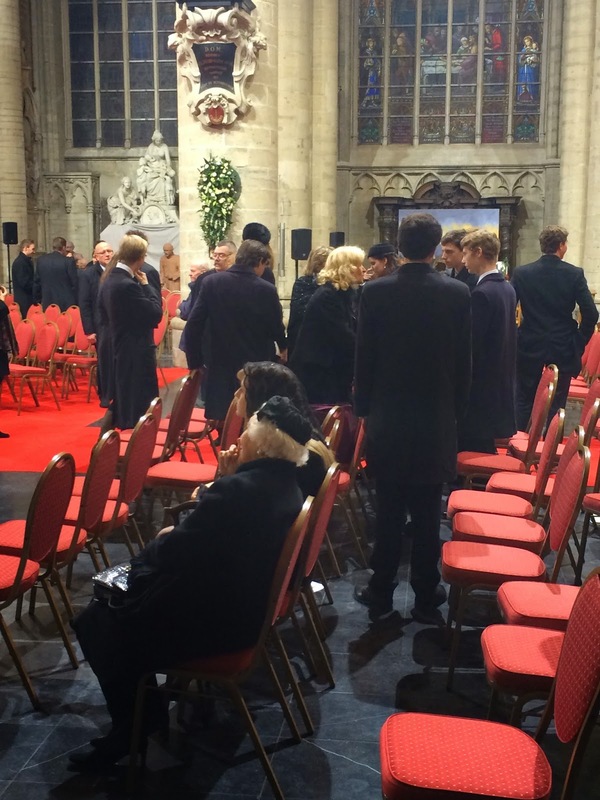 It still seemed very strange: I had already left my seat, while the senior royals still seemed to be inside. It became stranger when I saw Grand Duke George walking off the stairs: so he was allowed to leave before the Kings and Queens? Or had those royals already left through another door? Questions, questions. 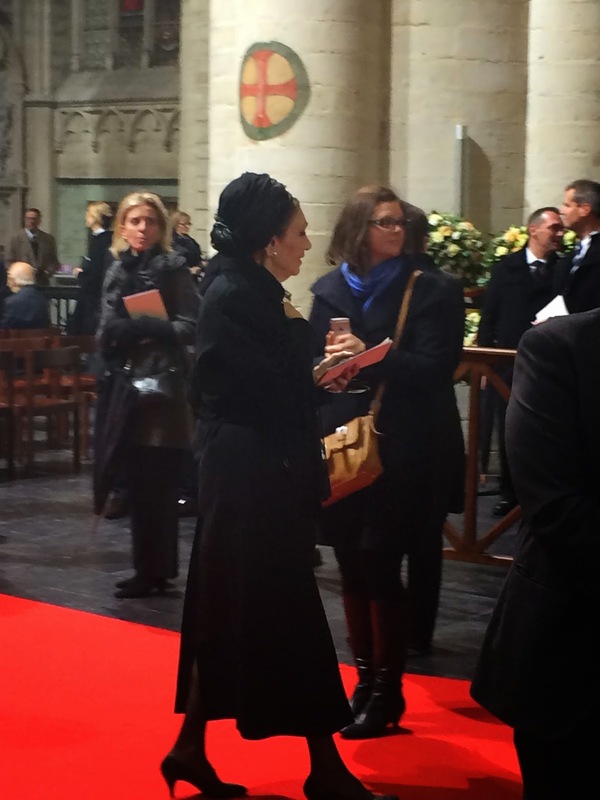 Then I saw the Empress of Japan coming out of the Cathedral. So it became clear to me that the senior royals hadn't left from another exit, but were still in the Cathedral. I looked up and it seemed like it was allowed to go back inside the Cathedral once you had left. Since I figured many royals were still inside, I decided to go back inside as well. Good decision. I walked inside and I almost bumped into the Duke of Castro, who was on the telephone. Some moments later, I saw a woman with a very familiar face standing very close to me: it was Empress Farah. Very strange! When she was a bit further away, I took some pictures of her. I saw on the TV screens that the highest ranking guests were still in their seats, as I already thought they would be. I decided to stay were I was: near the aisle, close to the door, so I could have a good view of the leaving royals. 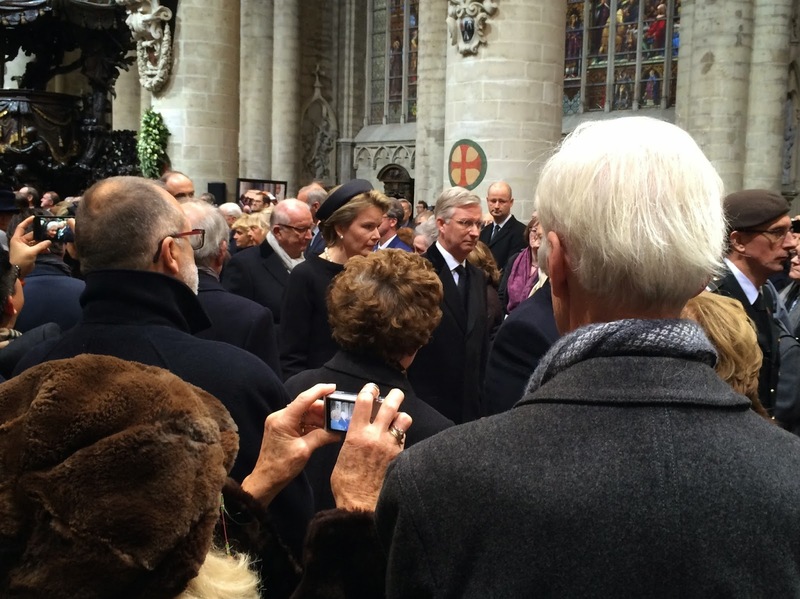 When the most senior royals had left, I saw that many family members and other guests were still in their seats in the front of the Cathedral. As everybody was allowed to move freely, I decided to walk to the front. 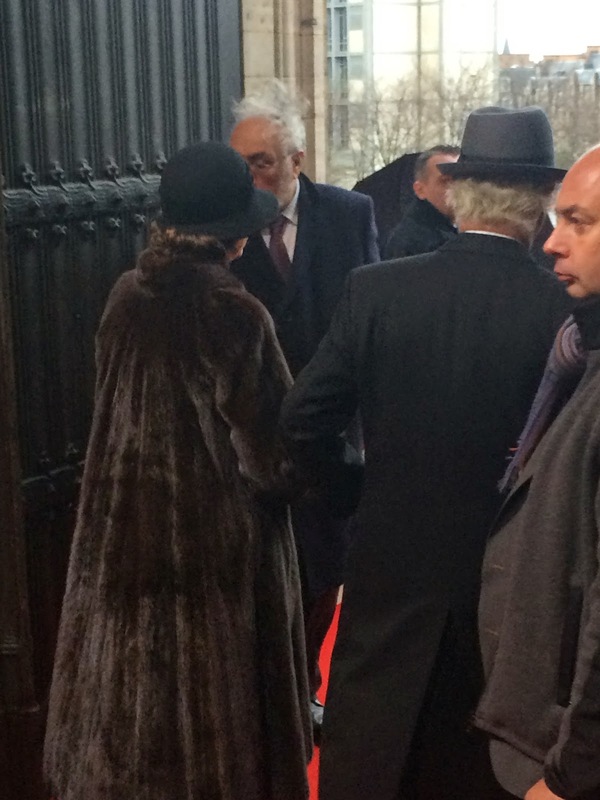 On the way, I saw the Duke and Duchess of Castro chatting with Archduke Simeon and Archduchess Maria of Austria. Then Princess Sirindhorn of Thailand approached me, surrounded by some entourage. Someone helped her put on her coat. 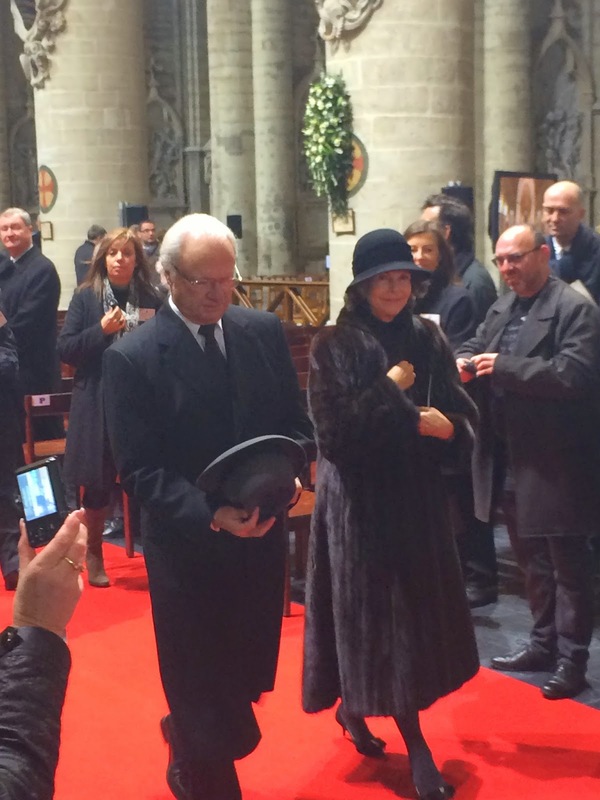 I also saw the Duke and Duchess of Angoulême. All those people were standing very nearby, so it felt very inappropriate to make pictures. I couldn't stop being surprised by the fact that I could just walk there. 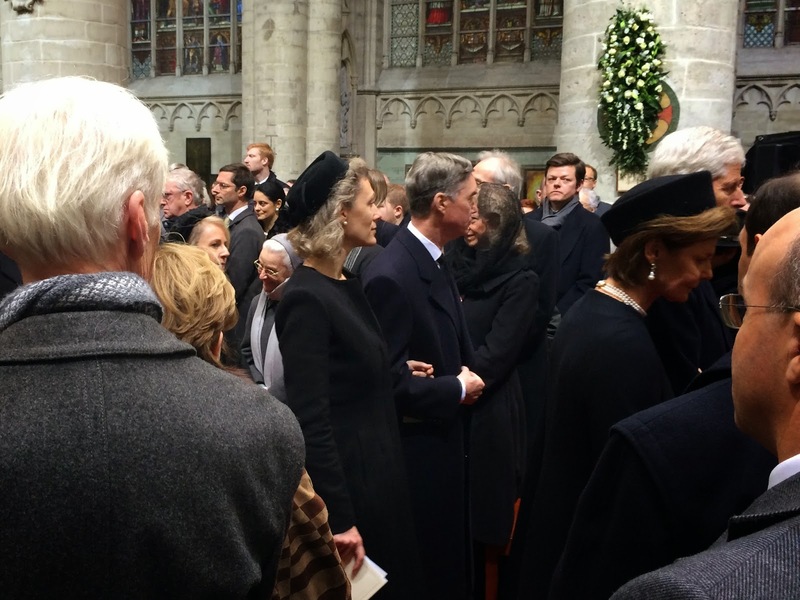 When I got to the front of the church, I saw many younger members of the extended family still being there, together with old Archduchess Yolande. By then, it was time for me to leave. My head was full of all the impressions of that morning. I think this was a once-in-a-lifetime experience. 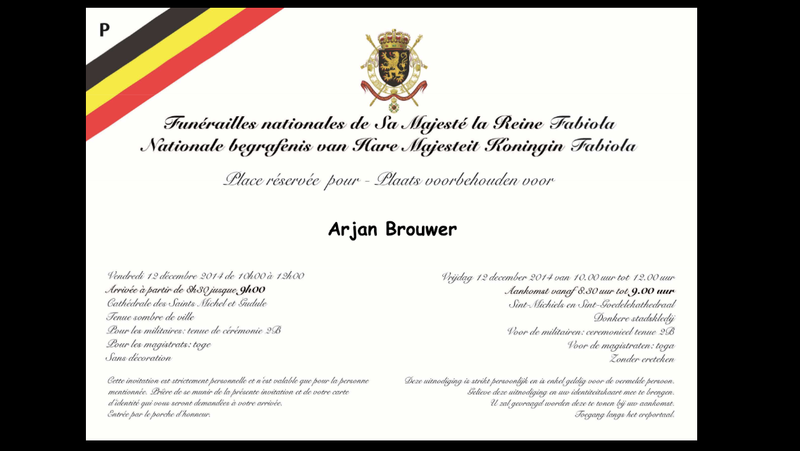 It was huge honour to be invited and I'm very grateful to the Belgian authorities. I'm also grateful to them that the protocol was a bit of a chaos: thanks to that, I could come closer to so many royals than I could have ever thought. If you're on Twitter, make sure you follow me: @houseoflemon. Thanks to Marlene Koenig for asking me to write something about my experiences. It was my pleasure! What a wonderful experience to have. YOur pictures are lovely and not intrusive at all. 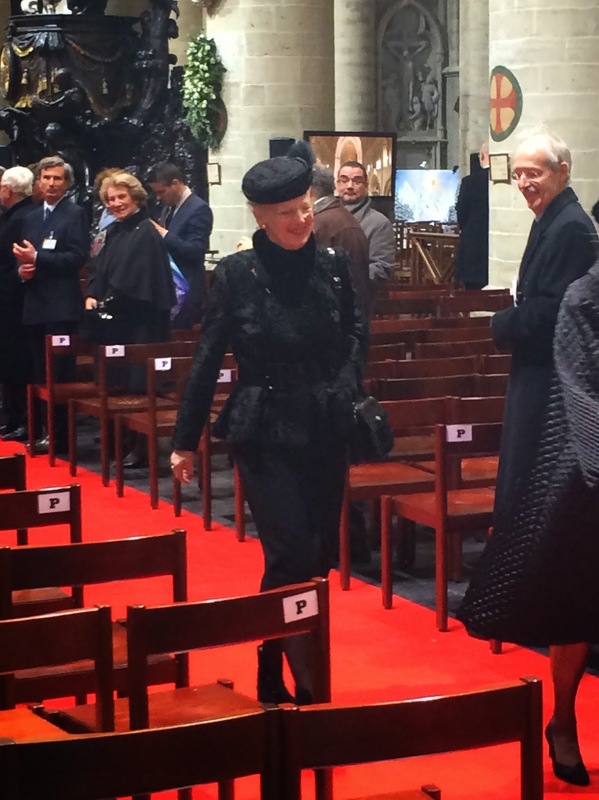 Queen Fabiola's entire funeral program from beginning till end was so nicely arranged and conducted that it was really a great experience being there and saying good buy to such a nice royal personality. Pictures that you posted are good but in few pictures distance seems little extra. A little bit more zoom could make those even better. John Doe, a rather rude comment. Perhaps the photographer did not have a zoom lens.